Days after Australian Prime Minister Malcolm Turnbull returned from a successful visit to India, speculation emerged that New Delhi might reject Canberra's request for participation in Malabar, a multilateral naval exercise comprising India, the US and Japan. A media report noted that a formal submission by the Australian defence attaché to New Delhi for the Australian Defence Forces to attend this year’s iteration in July as an 'observer' had failed to elicit a response. Expectedly, there is disquiet in Canberra, where Australia's re-instatement to the Malabar exercises is a priority issue in developing the relationship with India. The Indian government’s political constraints are, of course, well known. Since 2007, when Beijing reacted strongly to a quadrilateral naval exercise in the Bay of Bengal, New Delhi has been wary of repeating a similar experiment. Indeed, every time there has been talk of joint naval exercises between India, Japan, Australia and the US, China has made its displeasure known. While New Delhi appreciates the logic of the grouping known as 'the Quad', Indian policymakers have shied away from a grand maritime alliance in the Indo-Pacific. Given the complex nature of India-China diplomatic interactions, New Delhi has desisted from crossing China’s nautical red-lines. But India’s Malabar dilemma is also a product of time and circumstance. After the Dalai Lama's controversial visit to Arunachal Pradesh, the Modi government is under pressure to lower the diplomatic temperature with Beijing. Incensed by developments in Tawang, China has been looking at ways to get back at India, including some counter-moves in the maritime arena. Chinese maritime analysts now talk openly about building naval bases and deploying aircraft carriers in the Indian Ocean. Already, Beijing is contemplating a defence pact with Pakistan, supposedly for securing the China-Pakistan Economic Corridor connecting Gwadar port with Kashgar city in North Western China. But Chinese leaders are also unhappy with New Delhi for refusing to participate in the One Belt One Road project, of which the Maritime Silk Road, passing through South Asia’s sensitive littorals, is a key component. Under the circumstances, Australia’s inclusion in the Malabar exercise, Indian policymakers fear, could trigger a game of high-stakes brinkmanship with China, with damaging consequences. This is not to imply that India’s maritime planners do not recognise the need to deter Chinese naval activity in the Indian Ocean. Recent PLAN deployments in India's near seas have raised caused consternation in New Delhi. Senior Indian naval officers say there have been at least six Chinese submarine visits to the Indian Ocean in the past four years. Recent dockings have been confirmed by satellite imagery, which shows a high incidence of Chinese submarine tender ships and marine survey vessels in Sri Lankan ports. The revelations that China plans to deploy marines in Gwadar and Djibouti in the Western Indian Ocean has further peaked Indian anxieties, raising Delhi’s compulsions to increase security cooperation with friendly states in the Indian Ocean region. And yet, China’s growing naval power in South Asia isn’t the only thing weighing on Indian minds. Increasingly, Indian naval planners have to contend with another reality: Sri Lanka’s growing importance in Indian Ocean geopolitics. Colombo’s developing ties with China, Japan and the US, Indian analysts say, have begun to shape New Delhi’s geopolitical calculus, as Indian maritime planners contemplate responses to the emerging strategic dynamic in South Asia. Tokyo recently offered to assist Colombo in buying P-3C maritime surveillance aircraft and also develop Sri Lanka into a base for strategic maritime surveillance in the Indian Ocean region. There is already a Japan-Sri Lanka project for Maritime Safety and Capability Improvement worth approximately US$16.5 million, which includes the provision of two patrol vessels to the Sri Lankan Coast Guard. Earlier this month, Japanese Prime Minister Shinzo Abe even suggested the Sri Lanka navy join the Malabar naval exercises as an observer. To be clear, none of these developments are inherently troubling for New Delhi. As a potent maritime power and security provider in South Asia, India sees merit in Colombo’s deepening ties with US and Japan. Indian observers acknowledge co-opting Sri Lanka in the defence of the regional littorals could be useful in neutralising China’s influence. This would also allow India to circumvent the diplomatically unpalatable proposition of a 'quad' with US, Japan and Australia. And yet, Indian maritime planners aren't entirely sure if they would prefer Colombo over Canberra as a partner in the Malabar exercises. The problem, for many, is Sri Lanka's reluctance to genuinely commit itself to a multilateral security agenda. Beyond constraints imposed by its limited maritime capability and a warming security relationship with China, Sri Lanka's record as a strategic ally is a checkered one. As a geographically well-positioned island state, Sri Lanka has inherently transactional instincts. Not only is Colombo eager to capitalise on its favorable location at the nexus of international trade, it is seeking to leverage political relationships for material gains. India's political observers empathise with Sri Lanka's developmental needs, but suspect it may soon become a catalyst for geopolitical power-play. Given Colombo's strategic trajectory, heightened naval interaction with Sri Lanka might serve tactical ends but could undermine New Delhi's political influence in South Asia. India's strategic elite might instead try keeping Australia - a more capable and committed naval power - interested in Malabar, without immediately inviting Royal Australian Navy warships to join the exercises. India's naval planners know well that the 2017 Malabar is going to be controversial, not least on account of the presence of Japan's largest helicopter carrier, Izumo. Inviting Australia to join the exercises would almost certainly cross Beijing's tolerance threshold, triggering a backlash that New Delhi might find hard to contain. India's cautious approach in upgrading naval plans in the Indian Ocean is not hard to discern. 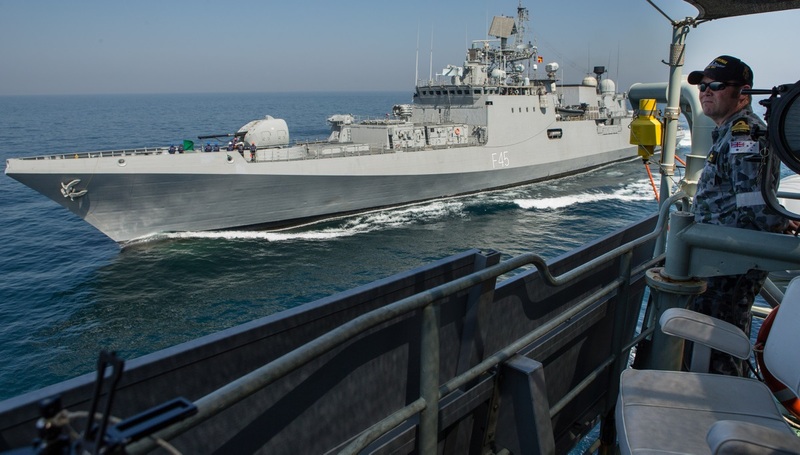 It has taken inordinately long for India to operationalise its logistics agreement with the US, and a case for a similar pact with the Australian Royal Navy has been put on hold until the efficacy of the former is clearer. It thus appears New Delhi would like to approach the 'Quad' in controlled, gradualist fashion. New Delhi could, in the coming days, agree to the participation of some Australian naval officers and Sri Lankan naval assets in the 2017 iteration of the Malabar, signaling a strengthening of the regional security architecture. In the long term, however, Indian maritime planners would base their decision to include Australia as a functional partner in the naval exercises solely on the nature of China’s evolving maritime posture in the Indian Ocean. For the moment, the 'Quad' clearly remains a bridge too far.